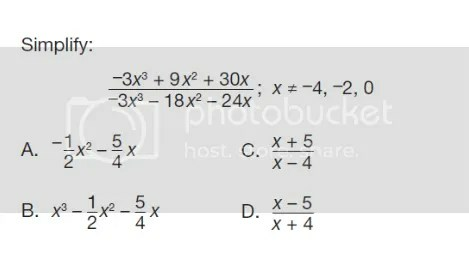 Here in Pennsylvania, many high schools are gearing up for the upcoming Keystone Exam in Algebra 1. In this first year of Keystones, the Algebra 1 exam is being given not only to students as they complete Algebra 1, but also to 10th and 11th graders who have passed the course in the past. The state has provided a number of sample items, which we have been using in math classes to help our students prepare. So, how could teachers and students view this problem differently? 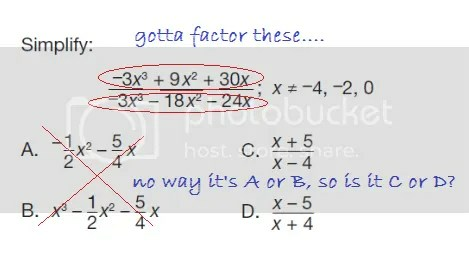 My teacher eyes tell me immediately that this is a factoring problem. I’m not sure how it is going to factor yet, but I am pretty confident that the answer will be C or D. Choices A and B are not really even up for debate here. My radar perked up when a colleague shared that a handful of students in one of her classes chose B. B??? How the heck did they get B???? My old nemesis….cancelling across addition and subtraction signs, how nice to see you again! So, while I immediately see the problem as two expressions which will separately require factoring, I need to remember that students don’t always view problems the same way. Being able to identify, discuss, and personalize these common errors are all part of the wonderful art of teaching. And while illegal cancelling will be a struggle for students long after I retire, I often use the exercise below to generate discussion. So, either I have made a math error here, or I have a great method for generating some side income here (and why am I sharing it with you, anyway???). 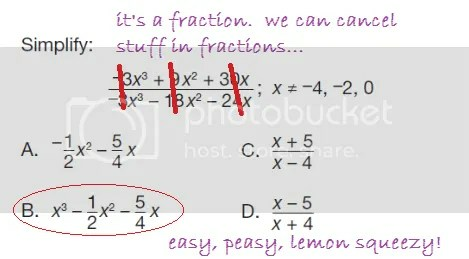 This entry was posted in Algebra and tagged factoring, mistakes. Bookmark the permalink.